Sunbrella fabric is a state-of-the-art fabric. It appeals to both commercial and residential customers because it holds ten superior qualities that home owners and commercial businesses look for when choosing indoor and outdoor replacement cushions. Sunbrella is a premium fabric, meaning, that the fabric is superior in many ways to other fabrics used for similar applications. You will pay more for it, but it will outperform all other non-acrylic fabrics. Sunbrella is used in both indoor and outdoor situations. If you live in the sunbelt or have a four season room in your home, Sunbrella fabric is a must have for your furniture. To get the most out of your money and enjoy your cushions for a very long time, worry- free, choose the highest rated cushions in the industry, choose cushions made with Sunbrella fabric. What makes Sunbrella fabric such a great fabric is that it is a solution-dyed acrylic. Most other fabrics have inks are printed onto a white base fabric, however with Sunbrella, the dye is added to the liquid acrylic and formed into fibers before the fibers are spun into yarn. The colored yarn is then woven into the the wide range of fabric designs making fulfilling its superior qualities. The combination of the proper amounts of dyes, acrylic resin and ultraviolet light (UV) inhibitors ensure that the colors bright and true. Through many years of research and practical applications, Sunbrella perfected its innovative yarn to be soft and luxurious. When the yarn is woven into the fabric, the result is a soft, comfortable fabric that can be used inside your living room or out on the patio. UV sun rays can break down the bonds of polymers that are not treated properly with inhibitors. Sunbrella uses UV inhibitors in its acrylic formula to ward-off the damaging UV sun rays and warranties it for up to 5 years. That’s a long time in the fabric world and you can bet that you will never have to worry about fading during that 5 year period and probably a lot longer. Even though the nature of Sunbrella acrylic fabric is waterproof on its own, Sunbrella treats their fabric with a repellent that is designed to last for years and provides you the best protection against water resistance available. Sunbrella cushions do not promote mold or mildew growth. Mold and mildew grow when your cushions are dirty or are composed of organic substances like cotton. It’s easy to keep your Sunbrella cushions free from mold and mildew by keeping them clean and not let dirt, pollen or other organic substances from building up on the cushion. Clean-up can be messy and sometimes just impossible with many fabrics. 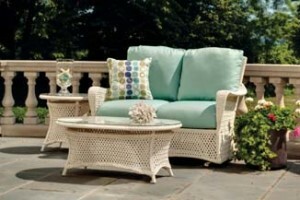 But, with Sunbrella fabric, its easy to clean and return it to its original luster. Visit the Sunbrella care and cleaning page for more details. Many factors play into determining how long a cushion will last. How well it’s sewn, the quality and amount of fill inside the cushion, the fabric used and how well they are taken care of will all have a factor in longevity. Ultimately, if the cushion is a quality built cushion with Sunbrella fabric, the longevity and use of the cushion is based primarily on wear (how much you use it). With average wear the consumer can depend on 3-15 years use from cushions made with Sunbrella fabaric providing proper care and cleaning are followed. This is based on heavy (commercial) to light (residential) usage. Sunbrella makes environmental responsibility a priority and offers recycling services to customers. Sunbrella fabric is GREENGUARD GOLD certified, contributing to healthier indoor air quality by being a very low emitting interior product. Sunbrella offers a 5 year limited warranty (for installations after 2008) for furniture fabric which is the best in the industry.